Yixian County was founded in 221 AD, and despite more than 2,000 years of history, remains the place of towering craggy mountains, elegant vistas as well as white walls, black roof tiles, and row upon row of Hui-style rural architecture. Here, farmers have lived peacefully for generations, working the land with honesty and decency, living out ancient customs. The county is nestled up against the foothills of the Yellow Mountains, whose beauty has been admired by visitors since antiquity. This paradise, now ever more accessible through better transport and information networks and plugged into the global economy, is growing smaller and smaller. The desire to preserve the area’s cultural heritage for future generations while at the same time opening it up to contemporary society is a conundrum redoubled, and one which is constantly testing the wisdom of the local population. Urbanization continues at a formidable pace in today’s China, assaulting older patterns of city and country and redistributing resources. Freedom is following these new economic forces, but they are also confusing urban borders and altering preexisting social structures. Transformation of industry and the rise of the service and tourist sectors are radically changing the economic links between urban centres. China is in a period of intense change. Yixian is a county with a long history, rich cultural heritage, and vast organizational system that maintains rural and agricultural traditions. One could say it is a perfect representative sample for researchers of contemporary Chinese society. For thousands of years, Chinese society has relied on a profound mutually beneficial relationship between urban and rural communities. Yixian sits in the Huizhou area of Anhui, one of the finest examples of this harmonious balance between city and country. Ever since the Ming and Qing dynasties, the peasants of Huizhou have sent their younger sons and brothers to the cities to engage in trade where they accumulated considerable wealth. Huizhou’s traders were always a dynamic force within China’s economy as a whole. When away from home, they formed trading associations for support and assistance before bringing their wealth back home from the cities to the countryside so that their wives, children and parents could build large homes and ancestral halls and set up free schools, orphanages, and organizations to look after the poor and elderly. This all ensured the continued prosperity of rural society and clan culture. However, as social structures began to divide along urban and rural lines, reinforced by the creation of the household registration system, urbanization deepened and rural communities were marginalized. The mutual nurturing of city and country that had existed in China for so long has slowly been turned upside down. When not being merged into surrounding cities, large swathes of China’s agricultural land is being left fallow. Farmers struggle to continue working the land, so labour has no choice but to flood into the cities in order to take up unskilled work. Those who have grown up in agricultural communities have suffered from poor levels of education and added to barriers established by the household registration system. These rural residents are unable to share in the spoils of urban growth; it is hard for them to compete for jobs, and it remains difficult to accumulate money to send back home. Yixian International Photo Festival is organized every year by the local government, and 2012 will mark its seventh year. This year’s festival is extending the invitation wider to photographers, artists, filmmakers and researchers to bring together a plurality of ideas and ways of thinking, as well as experiences from other frontiers in the town and country divide. The festival want to make Yixian a research site in order to open up research into today’s Chinese and Asian urban/rural divide. For this reason, the subject for this year’s festival is “Interactions”. The festival will devote itself to exploring positive models for the relationship between city and countryside, working hard to make this a mutually nurturing relationship in a contemporary context. This year’s festival is curated by Ou Ning and Zuo Jing, who made bases for themselves in two villages, Bishan and Guanlu, in Yixian, respectively, in 2010. In 2011, they organized Bishan Commune, in which they brought together artists and intellectuals to get involved in rural reconstruction in the local area, putting together the first Bishan Harvestival, which is set to become a yearly artistic event designed to use art to reactivate community life. 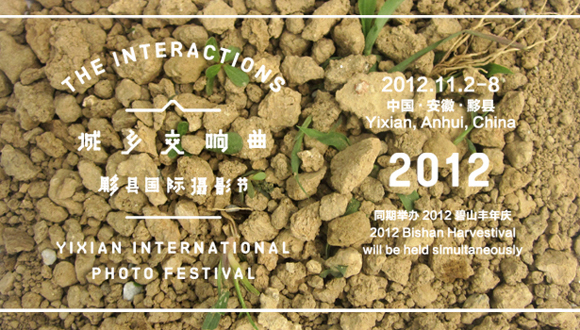 This year, Bishan Harvestival will be held simultaneously with Yixian International Photo Festival. Iwan BAAN, José Manuel BALLESTER, Gabriele BATTAGLIA + Claudia POZZOLI, DONG Wensheng, Deke ERH, FAN Lixin, GAO Yuan, Greg GIRARD, GUO Zhenming, HAN Lei, Hanggai, HE Chongyue, HONG Lei, HOU Dengke, HUANG Yen-pei, JIANG Pengyi, Aglaia KONRAD, Tong LAM, Sze Tsung LEONG, LI Yu & LIU Bo, LU Guang, LU Yanpeng, LUO Dan, OU Ning, OUYANG Xingkai, QU Yan, SHAO Yinong & MU Chen, SUN Jianchun, SUN Yanchu, Matjaž TANČIČ, TANG Guo, TANG Nannan, WANG Jiuliang, WANG Qinsong, WANG Tiewei, Abigail WASHBURN, WEI Bi, Stanley WONG (anothermountainman), Wu Tiao Ren, YAO Juichung, ZHANG Kechun, ZHAO Liang, ZHU Rui, and COAL+ICE project presented by the Asia Society’s Center on US-China Relations. For further information or images, please contact Caroline Peng: yixianfotofest [​at​] gmail.com.